T.J. Shanoff comes to Murray in the Morning from Chicago's legendary Second City Theater, where he was a writer, director and performer for Second City Communications and Theatricals. Most notably, T.J. has directed the music behind hundreds of shows with performers such as Colin Mocherie, Tim Kazurinsky, Martin Short, and Bill Murray. T.J. co-wrote "Sing Along Wizard of Oz," which is currently touring the country and likely coming to a theater near you. 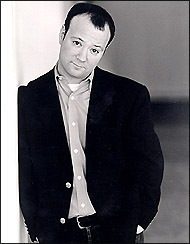 T.J. also co-created and co-produced "The Roof is On Fiddler" with Saturday Night Live writer Rich Talarico. The 1980's pop music parody of "Fiddler on the Roof" was called "hilarious" by the Chicago Tribune, and played to packed houses at Chicago's Improv Olympic. A native Chicagoan, T.J. has been heard on WSCR 670-AM "The Score" and has interned at WGN Radio. He is a life-long Cubs fan, and has not yet jumped off the Bulls bandwagon – which are two reasons you can usually find him crying and/or medicated. He thanks you for listening to "Murray in the Morning," because this job is the main reason he can pay his rent on time. Favorite TV shows: WKRP, The Office, SCTV, Real Time with Bill Maher, Seinfeld, Fawlty Towers, Inside the NBA with Sir Charles. T.J. Shanoff is a man of many skills... most notably writing songs and and improv comedy! Don't miss T.J.'s keyboard skills in the occasional Sports Lounge segment on MitM.